The shooting against a convicted underworld boss in broad daylight in downtown Sofia aims to bring instability to the country just months before the general elections to the benefit of the ruling party, an outspoken opposition leader argues. "This week's shooting and the assault against Ahmed Dogan [former leader of ethnic Turkish party] aim to bring instability and instill fear in the people," Tatyana Doncheva, former leading Socialist, who starting a new civic movement in 2010, told Darik radio on Thursday. "This is how Bulgarians, completely paralyzed with fear, will be ready to cast the ballot they are told to in the elections in the summer. These are well-known approaches and they have been applied many times," Doncheva, currently founder and head of "Movement 21", said. Doncheva has gained herself the reputation of a politician and a lawyer, who breaks the rules, a woman who feels stronger than men, a former MP who plays the violin and starts the day with Haydn and Mozart. "The events lay bare the special relationships that exist in Bulgaria's underworld, where the current government resides. There are crime bosses who are fans of the government, but others are not," said Doncheva, who owes her popularity mostly to her sharp tongue and her unending drive for independence. But independence always comes at a price. 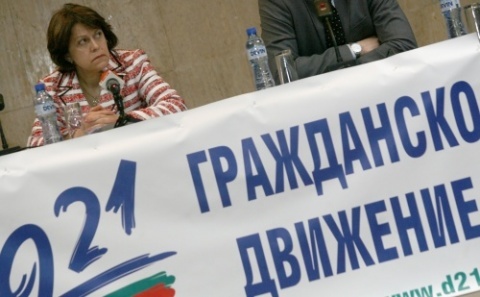 Doncheva has never been given a post in the heights of the Socialsit party hierarchy, while she was its member, despite enjoying notable public support. Some analysts believe that the mayor nomination itself was a way to marginalize Doncheva in 2010. The Socialists knew that she has no chance to win the run-off, and were pushing her to a political seppuku. Meanwhile it emerged that the life of the convicted underworld boss, who was shot and seriously wounded in broad daylight outside a courthouse in Bulgaria's capital on Tuesday, is still in danger. Zlatomir Ivanov, aka Zlatko Baretata (The Beret), underwent surgery for approximately four hours on Tuesday. The former member of Bulgaria's counter-terrorism squad, who became one of the best known mobsters in Bulgaria in the late 1990s, got 4 gunshot wounds at about 9:30 EET on Tuesday. The shooting occurred as he was about to enter the Central Courthouse in Sofia for a hearing in a trial in which he is appealing an 8-year sentence for leading a drug dealing organized crime group. One of the bodyguards of Zlatko Baretata was also shot and wounded during the shootout, in which the failed assassin, who was positioned on the roof of the Sofia Bar Association building across the street, managed to escape. Zlatomir Ivanov was arrested on February 7, 2009, after he turned himself in to Bulgaria's National State Security Agency DANS. He was charged with organizing and leading an organized crime group dealing with drug distribution and murders.